Oh, what a dream symbol the UFO is—and popular, too. It is common in dreams—not as much as, say, cars and animals, but more so than the majority of other symbols. Plus, UFOs and their alien occupants really raise the curiosity of people and spark all sorts of wild speculation about what it means and why they appear in dreams. A great number of personal and cultural meanings are projected onto UFOs. They have mythic status in society. Dr. Carl Jung wrote a book titled Flying Saucers: A Modern Myth of Things Seen in the Sky. It provides a starting point for narrowing down the possibilities and understanding the symbolism. Begin with the idea that a UFO is something unknown or unidentified. Fear of the unknown is a primary possibility to consider for the meaning of the symbolism, because UFOs are both unknown and sometimes feared. Of course, if instead of fearing a UFO in a dream you welcome it, fear is not the meaning. On the contrary, it might mean welcoming or embracing the unknown. For example, the night before meeting a relative for the first time, or going on a blind date, you dream about a UFO as a way of symbolizing meeting an unknown person. I’m your teacher, J.M. DeBord, aka “RadOwl” Click for bio. Expand on the idea like dreams do, and a UFO in a dream can symbolize not just fear of the unknown but fear of just about anything. Younger readers have grown up with a different idea of UFOs and aliens than the Cold War generations. To them, UFOs were a recently popularized phenomenon, and incidents like the 1938 radio broadcast of War of the Worlds firmly planted the idea in the minds of the masses that the occupants are hostile. Then starting in the 1980s, movies like Close Encounters and E.T. started a trend toward portraying the occupants of UFOs as friendly and enlightened. Also, a new danger from the skies entered the mass psyche during the Cold War: nuclear bombs. Dr. Jung closely tied the UFO phenomenon with the widespread fear that any moment, horrific death can rain from above. If you weren’t around to experience the hysteria it produced you probably can’t wrap your mind around exactly how much the possibility of thermonuclear war created an atmosphere of pervasive fear and dread—especially fear of things that could drop from the sky, such as missiles, bombs, and UFOs. These days, old and new ideas and perceptions of UFOs have mixed together to produce an enigmatic dream symbol. Much personal meaning can be projected onto UFOs and their alien occupants. Let’s do a quick rundown of the main possibilities, picking up where we left off. It’s a play on words that dreams can use to create symbolism, such as to express the feeling that something foreign is taking over your mind. As a symbol of something feared, a UFO in a dream can represent something like fear of separation (UFOs abduct people). Separation is one of the greatest and most common fears, ranking right next to death in the minds of many people. Psychoanalysts trace it back to the infant’s trauma of leaving the womb, separating physically from mother. Analytical psychologists (Jungians) trace the fear to the psychological separation that occurs when a child becomes a teen, or a teen becomes an adult. Until that separation happens and a child becomes a distinct, independent person, their identity is enmeshed with their family. Separation can be a terrifying prospect—it can feel like something in yourself is dying or being murdered—and UFOs are terrifying for some people, too. The symbolism is created by tying fear of UFO abduction with fear of separation. But don’t stop there. Because of the blank canvas presented by the UFO phenomenon, any sort of fear can be symbolized—fear of failure, spiders, declining health, evil, God, your true self. You name it. Alien can mean “foreign,” and since aliens are the occupants of UFOs (supposedly), UFOs can symbolize something that is foreign to you. It is outside the scope of your experience—unknown. An alien might symbolize a foreign person—also referred to as an “alien.” You might find yourself in a “foreign” place in your life, such as being pregnant with this unknown thing growing inside you, or an unfamiliar situation. Dreams are famous for this sort of word play. A scene like this can symbolize mysterious processes that occur deep in the mind while dreaming. More powerful dynamics come into play because people react strongly to new experiences and encounters with anything foreign to them. Also, learning something new rewires the brain. The rewiring process occurs during sleep. So for example, dreaming about aliens beaming messages into your brain while you are asleep might actually be a representation of a physiological process. Combine the “foreign to you” aspect of UFOs together with the powerful personal and neurological processes associated with learning something new and now you see why your dreams might pick UFOs to symbolize it. The association is easy to make because in the image of a UFO you have a summary of the experience. Take a step further and consider that “unexplained” and “UFO” go hand in hand. Unexplained can mean “don’t understand.” You can’t explain why your relationship with your spouse is estranged, and in response you dream about sleeping in the same bed with an alien. You can’t explain why you failed a calculus exam, and dream about being perplexed by alien hieroglyphics. You don’t understand why you are unhappy with your life, and dream about being taken by a spaceship to live on an alien planet, symbolizing the desire to make a radical change or have new experiences. Something else that people can have a hard time explaining is themselves! The greatest mystery of all is the human being. 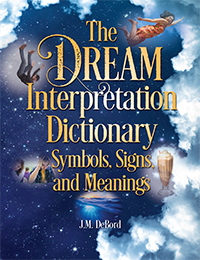 My dream dictionary explains the psyche and the unconscious. The psyche is constructed of two main parts, the conscious mind and the unconscious mind, and they can be as far apart as Mars and Venus. The unconscious mind came into existence with the human species and is shaped by the experiences of our ancestors during millions of years of evolution. The conscious mind is a product, by and large, of modern society. In simplistic terms, it’s caveman vs. astronaut. What the unconscious mind wants and perceives and what the conscious mind wants and perceives can be vastly different. When you look into the eyes of an alien or see a UFO in a dream, what you might actually be seeing is an estranged, unknown, foreign. or “alienated” part of yourself—your unconscious mind personified. Stretch the idea and in the UFO you might see something new about yourself emerging, like a UFO rising out of the ocean or appearing suddenly in the sky, or an alien occupant exiting a spacecraft. When it first emerges you have no idea what it really is, but in time the picture clears up. Dr. Jung made a strong connection between UFOs and spiritual experience. People who don’t have some sort of spirituality deny a basic need. Take belief in God and all that out of the equation and look at it simply as a fundamental need of the psyche. People need to feel connected. They need community. They need meaning and purpose. Denying it creates an imbalance in the psyche, and as a self-regulating system the psyche will eventually snap back—powerfully, too, depending on how much imbalance is compensated and how long it is neglected. When this happens, the conscious side of the mind is forced to confront itself and what is lacking. The atheist dreams of visitations by angels. The agnostic is given visions of heaven. UFOs hover over your home and aliens appear in your bedroom. 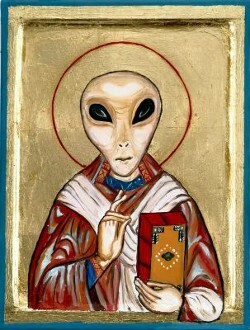 A popular notion and even hope is that aliens will visit earth and teach us their advanced spiritual ways. Not to say that all cases of UFO sightings and alien abduction are the result of compensation or imbalance in the psyche, but spirituality is a major component of the cultural phenomenon of UFOs and aliens. The belief is widespread that our extra-terrestrial brethren are going to provide the answers we seek. For a person searching for meaning, there is nothing like a UFO encounter to provide it! It can be life-changing. Dr. Jung himself compared the UFO experience to an encounter with the Christ archetype, the ultimate symbol of transformation and the Self—the complete person internally united. UFOs in your dreams can mean you are being called to go through a great change, a raising of consciousness and transformation of yourself and how you view life and the cosmos. “UFO” and “God” can be said in the same breath because both are “out there” somewhere in the universe—or beyond it. One research study found a connection between dreams, alien abduction, and the emergence of special abilities in people. 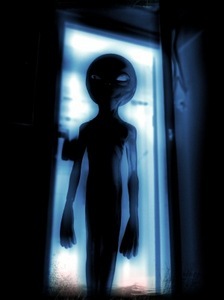 The experience of encountering aliens was produced in a laboratory setting by teaching participants how to have out of body experiences in a dream state. 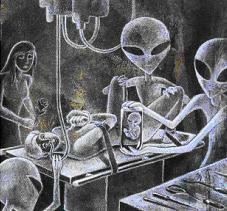 Alien abduction can symbolize fear of being forcibly taken away. For example, one man dreamed about being abducted by aliens from his family home and it symbolizes his job taking him away. Consider another possibility for dream symbolism tied with UFOs. What are the odds you can fight off or outwit the occupants of a UFO? That perception of being outmatched by superior power, technology, and intelligence is an easy association for dreams to make when you are up against something overwhelming, or feel powerless. For example, say that a much larger company wants to gobble up your company in a hostile takeover. That situation could be symbolized in a dream as an alien invasion. Or say you are dealing with a hostile government bureaucracy, matching you and your limited resources against something that is vastly bigger and more powerful than you are. Yep, aliens. Symbolism can be created from how people would react during a crisis like an alien invasion. They’d lose their minds! In an exaggerated way the situation is comparable to others things people panic about, such as foreigners coming over the border. A situation where people panic and lose their minds can be symbolized as an alien invasion. Or perhaps the situation isn’t that dramatic. Maybe you are just really busy at work, school, or home and every day feels like a battle. Is Sleep Paralysis at the Heart of Alien Abductions? Into this soup of possibilities for symbolism we add another ingredient, sleep paralysis. Read enough UFO reports and you notice a trend that many begin something like this: “I woke up from a deep sleep and…”. The person sees lights outside of a bedroom window, hears strange noises in the house, or encounters little green guys at their bedside. Sleep paralysis occurs naturally while dreaming to prevent the body from physically acting out dreams, officially known as REM atonia. However, a person can wake up and still be dreaming—and paralyzed. Paralysis creates fear, and the dreaming mind responds to fear by producing fearsome imagery. 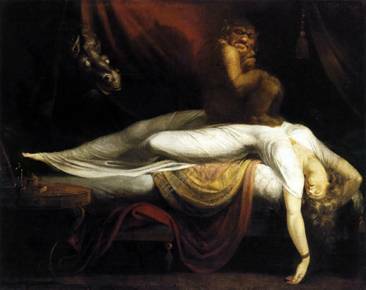 If a person fears witches or demons or something like that, they might see witches or demons during sleep paralysis. Witch, succubi, and incubi myths are believed to originate this way. If a person fears aliens and experiences sleep paralysis, well, the dreaming mind produces imagery of aliens. The hallucination is completely realistic. Your eyes are open and you are still dreaming. Finally, an explosion of interest in paranormal subjects is saturating media and entertainment outlets with imagery and references. Shows like Ancient Aliens attribute to aliens everything from the building of pyramids to natural disasters. Interest in the paranormal has penetrated deep in Western culture (and probably other cultures as well), creating a wealth of personal references for dreams to draw on. I will show you how to interpret your dreams. Dr. Jung describes flying saucers as a “modern myth.” He doesn’t mean myth in the sense of something fake or unreal. Instead he uses it to mean a central point around which people build meaning and describe deep personal experience. Myths are a canvas on which we project our psyches, providing a story structure to explain things that are otherwise difficult to put into words or unexplainable. For example, slaying a dragon is an archetypal myth, meaning it appears in some form in most if not all cultures. Slaying a dragon is a way of describing overcoming the forces of resistance to exploring the unconscious mind, or overcoming the ego or some bad character trait. Dragons are a relic of the past, from before we knew they don’t exist. UFOs are a myth that describes the experience of living in the modern world, and we still don’t know if they really exist (though if you really look into the subject, there is no doubt). In a sense you could say that dragons are the aliens of previous eras, because aliens, too, can symbolize what you fear about yourself and your unconscious mind. As a modern myth, UFOs are a sort of umbrella under which a wide variety of experiences and associations can be placed: fear, unknown, foreign, fantastic, power, paranormal. When UFOs appear in your dreams, take your pick among the many possibilities for symbolism. But remember that your own experiences and associations matter most. Meaning and symbolism of a Dream About Aliens: Are Martians Among Us?